On 28 April the Bit by Bit team travelled to Nottingham to meet members of the Executive Team at the EPSRC Centre for Innovate Manufacturing in Additive Manufacturing, which is hosted by the Additive Manufacturing and 3D Printing Research Group (3DPRG) at the University of Nottingham. For this visit the Bit by Bit project team of Tim Minshall, Letizia Mortara, Simon Ford and Dominik Deradjat were joined by Ronan Daly and Ching-Hsien Chen, colleagues from the Inkjet Research Centre at IfM. At Nottingham the group met Prof. Richard Hague, Director of the Centre and Professor of Innovative Manufacturing; Chris Tuck, Deputy Director; Prof. Phill Dickens, Executive Board Member and Professor of Manufacturing Technology, and Phil Reeves, National Outreach Coordinator for the Centre and Managing Director of Econolyst. During our visit we were treated to a tour of the facilities and heard about the evolution of the group’s research activities. The group has historically worked very closely with industry at higher technology readiness levels; in recent years it has expanded its range of activities to conduct more basic science and experimental work. The group is rapidly expanding, with it this year also becoming the EPSRC Centre for Doctoral Training in Additive Manufacturing. As well as hearing about their activities, we also shared some of our current work on mapping the emergence of 3D printing. As our hosts have significantly more knowledge about the industry we received some excellent feedback on the content within the maps, had some outstanding questions resolved and some pointers on issues that we could investigate. We look forward to further discussions with the centre and participating at the Additive Manufacturing and 3D Printing International Conference at Nottingham in July. In previous research at the Institute for Manufacturing we explored the phases and transitions of industrial emergence and developed a framework for mapping industrial emergence. On the basis of that framework, a suite of tools was created. Each of these tools were based on the technology roadmapping principles in which one axis is time-based and the other comprises a number of thematic categories. We want to use some of these tools in the Bit by Bit project in order to map and understand the emergence of the 3D printing industry. The challenge is that the industry is very complicated, with this complicatedness stemming primarily from the huge variety of 3D printing technologies. The main technologies currently being used by leading companies are fused deposition modeling, stereolithography and selective laser sintering but there are also many more. One of the approaches that we’ve used in the past is to create ‘quick scans’ of industries (e.g. synthetic diamond, silicon gyro, digital camera). These have been historical maps that have been generated decades after industrial emergence occurred. Drawing on existing historical accounts allowed such maps to be created relatively easily and allowed the identification of the key phases and transitions, and barriers and enablers to emergence. For a live industry encompassing so many different technologies it is far more challenging. It has been necessary for us to try to simplify what is a rich and evolving industrial landscape. The mapping approach we’ve elected to take involves looking at individual companies to see what technologies they have been developing, the products they have released, and the markets into which they’re being sold. These three applications are used as the three layers of our maps. Before going any further it is important to provide a caveat. We have so far only used publicly available data (e.g. annual reports, company websites, newswire, industry blogs) when creating the maps. This means that the picture is often far from complete and we recognise the need to collect data from the companies themselves so that our maps are more comprehensive. The benefit of the mapping approach is that it allows the effective visualisation of the history of a company’s products, the technologies these are based upon, and the different markets that are the customers of these products. 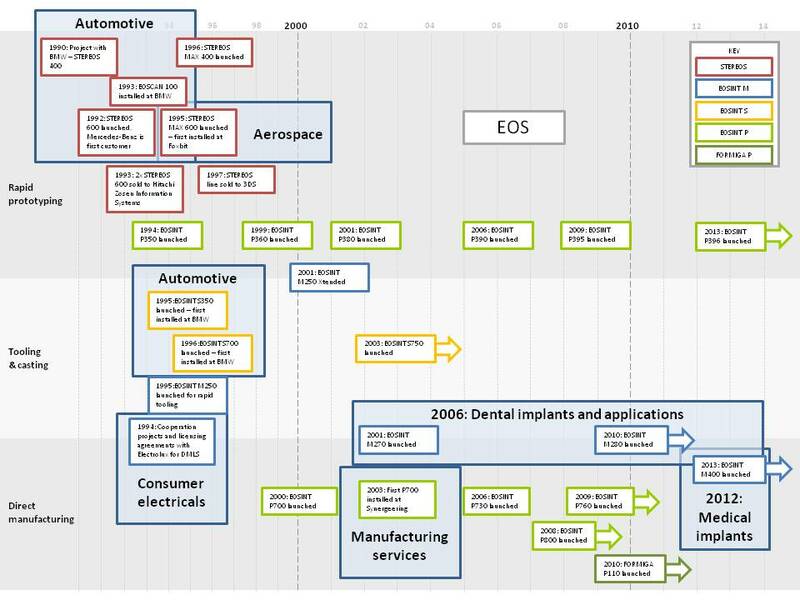 In the EOS example below it is readily apparent that automotive was a lead user for EOS’s stereolithographic product line and again when EOS developed its EOSINT S line. A visual limitation of this approach is the discrete categorisation of a 3D printer into a particular application. Depending on the requirements of the customer, these machines are often used for a variety of purposes. For example, EOS promotes its EOSINT P396 as allowing “the tool-free manufacture of serial components, spare parts, functional prototypes and models directly from CAD data”. Despite the multi-purposeness of the product, our mapping technique only allows it to be assigned to a single application and it has therefore been put in what we understand to be its primary application (rapid prototyping). How did 3D printing technologies move from one application domain to another? What was the process through which this occurred? What types of demonstration enabled these transitions? What did the process of demonstration involve? We are also working on a separate visualisation that shows how different companies in the 3D printing industry have acquired (internally and externally) the capabilities of different 3D printing technologies. We’ll share more on that in a future post. The Complete 3D Printing Conference was held on 25 March in London. Bit by Bit researcher Dominik Deradjat gives his summary of the event, which included presentations from a diverse range of perspectives. Phil Reeves, MD and Principle Consultant at Econolyst, opened the conference with two presentations on the landscape of additive manufacturing. In his first session, he focused on the industrial manufacturing sector, providing an overview of additive manufacturing and elaborating on business drivers and technology adoption. In particular, cases and application in the medical, automotive and aeronautics sector were presented. Then in his second session, Phil discussed the consumer 3D printing landscape, its commercial ecosystem and the dominant companies in the sector. He identified growth opportunities and limitations, offering a realistic and fact-driven evaluation of the current and future achievements in areas affected by additive manufacturing. In contrast to overenthusiastic expectations that can be encountered with the topic of 3D-printing, this presentation was refreshingly objective and grounded in reality. Scott Dunham of Photizo Group provided a detailed overview of 3D printing vendors including financial results and a market assessment. Leading companies such as 3D Systems, Stratasys, ExOne and Voxeljet were evaluated and compared. Cydni Tetro of 3DPLUS.Me described 3D printing strategies for merchandise and retail, elaborating on the importance and role of customisation and technical opportunities additive manufacturing offers. She stressed that the adaptation of additive manufacturing is still in an early stage and that technical issues such as colour and finishing still have to be addressed when considering implementation for merchandise. Other presentations included Will Harvey’s case study of how IBM and Ogilvy implemented 3D printing for the real-time production of souvenir trophies at Wimbledon 2013, and product designer Assa Ashuach’s ideas for creating businesses in additive manufacturing. Towards the end of the conference, Chris Higgins and Vann Pearce of Orrick, Herrington & Sutcliffe gave an introduction and overview of patent issues in 3D printing. Additive manufacturing has created grey areas in IP as existing laws do not capture the novel mechanics of how objects created from data files function. Future legal disputes and regulatory changes will have to be observed to provide clarity in some legal areas. The closing speaker Andrew Dawood, a specialist in periodontics and prosthodontics, talked about how additive manufacturing contributes to his medical practice. Specific cases in which the technology realised customised implants or allowed the physical creation of models for visualisation and preparation for surgeries underlines the importance of 3D printing and the impact that it’s having in the medical sector. The next 3D Printshow in London will take place in September 2014, exact dates to be determined. Letizia Mortara of the Bit by Bit project will be speaking about 3D printing and new business models at the Cambridge Enterprise & Technology Club on 24th April. She will be joined by David Smith of TTP, who will be talking about the opportunities for TTP Vista inkjet in 3D printing, and serial entrepreneur Roberta Lucca of Bossa Studios.